The other day, a friend and I were discussing an article I had written (that appears in my book) about maternal advice to a daughter regarding the spiritual crisis that might befall her if she ever loses a child. What I said in the article, and still say today, is that existential crises and questions of faith in times of hardship are not modern phenomena. Medieval people routinely questioned their faith, most poignantly when it came to death. For medieval Christians, death presented only three options: heaven, hell, and purgatory, a state in which the soul languished until he or she was finally accepted into heaven after the purgation of minor sins that might have gone unconfessed at the moment of death. The trouble was that people did not know what state their souls would be in after death until it actually happened, which left people anxious about when death would come to them. Debates raged amongst theologians around hypothetical deathbed situations, so you can imagine the confusion and the questions of the common people who hadn’t studied the church fathers’ writings all their lives. This fear of purgatory and hell is precisely why papal interdict was such an effective weapon: even if monarchs like England’s King John were not particularly bothered by the fact that they might die unshriven, the general populace would have been most unwilling to risk it for themselves or for their families and friends. seem so severe to whomever it wounds? and the passions muster all their power? Later in the poem, March writes, “If I could be sure she with the blessed dwells, / I would not wish that she were still alive” (ll.239-240). In other poems, he writes of anxieties about how he’ll never know where his wife’s soul ended up unless his goes to the same place (XCIII, ll.1-8), and he worries about the possibility of “for all eternity, two hearts parting that had always been one!” (XCVII, ll.37-38) Clearly, reassurances from the church were not enough to suppress his fears or soothe his pain, despite March’s fervent desire for reassurance. 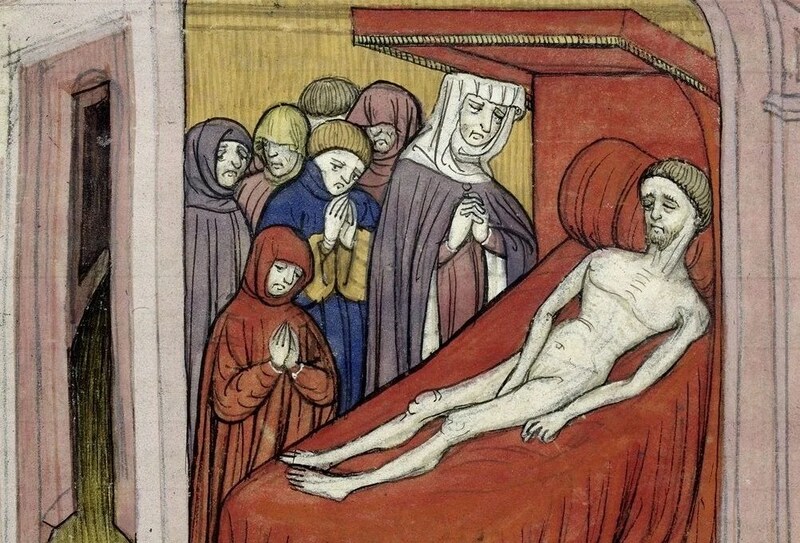 If medieval people were worried about the fate of a loved one’s soul, they could pay for masses or prayers to be said on the deceased’s behalf, in order to shorten his or her time in purgatory (just in case that’s where the soul ended up), but firm assurance was impossible. What agony it must have been to wonder about your loved one’s eternal soul! Although Christine is aware that these thoughts are not spiritually correct – that her faith should prevent them – she feels them so deeply that she risks public censure by writing her thoughts down instead of hiding them. Given the amount of loss experienced during Christine’s lifetime (during The Hundred Years’ War), it’s likely that the court for which she was writing felt more sympathy than judgement. In a religious society, like that of medieval Europeans, it can be difficult to admit just how deeply your own doubts may go, especially about such important concepts as the afterlife. Ausiàs March, though, expresses his spiritual fears and doubts with a rare amount of candour in a long poem he wrote when he believed he was facing his death. He prays to God to bring him the faith that he knows he should have, but admits that his plea comes from self-interest, saying, “my fear of you is greater than my love” (CV, l.57). March describes his terror of hell, but says, “I ask for Heaven, yet little prize it” (l.87) because he finds it so difficult to imagine (“we must guess at Paradise, unfelt”, l.208). March is a self-confessed sinner who admits to loving sin more than virtue, and though he fears the afterlife he’s been taught about in the Christian tradition, he struggles to believe in it. His poem is agonizing as he pleads for God to grant him faith enough to escape damnation, even though he knows he’s caught in the catch-22 that selfishness is not likely to earn him entry into heaven. Although March’s raw, brutal honesty is rare, his spiritual doubts and anxieties would not have been. While the medieval Western world was much more faithful than it is today, we should not assume that this meant they never questioned their religion, especially in times of grief and loss. For many medieval writers, the struggle to accept the mysteries of Christianity strengthened their faith, but struggle was certainly a part of it. To read Ausiàs March’s poems on love and loss, do check out the excellent Ausiàs March: Verse Translations of Thirty Poems. You can find some of Christine de Pizan’s poems on widowhood in The Selected Writings of Christine de Pizan, including the one I’ve quoted here.